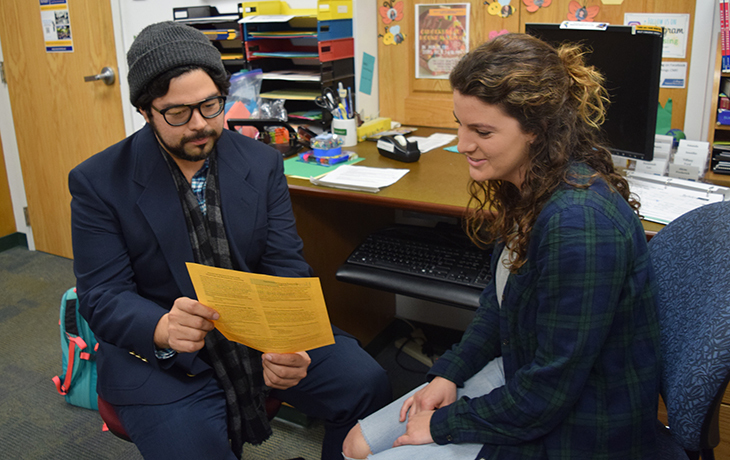 Advisor Ricky Vides and a CNR student during an advising session at the Office of Instruction and Student Affairs in Mulford Hall. Photo by Natalea Schager. Three members of the CNR community have been honored with Excellence in Advising Awards from UC Berkeley’s Advising Council. The Excellence in Advising awards recognize exceptional performance and innovation in advising. Recipients are noted for their commitment to providing student-centered, inclusive and transformational advising, their focus on collaboration, and their ability to create and innovate. Kay Burns, a graduate student affairs officer in the Energy and Resources Group, received the Mary Slakey Howell Award. UC Berkeley's highest advising award, it recognizes visionary leadership and exceptional contributions and dedication to the advising community. James Sallee, an assistant professor in the Department of Agricultural and Resource Economics, received the Outstanding Faculty Advising Award. Ricky Vides, a CNR undergraduate advisor, received the Outstanding Advisor Award. All award recipients will be honored at a reception and ceremony on Wednesday, December 12 from 4:00-6:00 p.m. in the Banatao Auditorium in Sutardja Dai Hall. Learn more and see all award recipients on the Advising Council website.